Audio Scripture Ministries provides the Bible in audio so everyone will have the opportunity to hear God’s Word in their own language. Partner with churches, ministries, and individuals toward creating and distributing audio Scripture media to communicate the Good News of Jesus. Facilitate production of audio recordings of the Bible in each language needed by people groups around the world. Distribute, either directly or through other ministries, suitably formatted Scripture recordings among both non-Christians and Christians, whether living in their homelands or elsewhere. Encourage and assist the development of projects for audio Scripture recording and/or distribution by indigenous and other ministries. 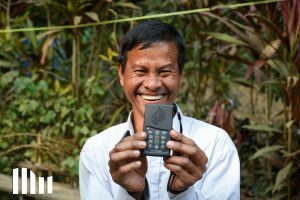 By recording and distributing audio Bibles and training technicians to do the same, Audio Scripture Ministries plays a crucial role in spreading the Gospel to the nations. Audio Bibles are fully portable. They never retire, or are asked to leave a country. Audio Bibles reliably provide God’s Word in a way that engages everyone, from members of oral preference learning cultures throughout the world, to refugees, immigrants, and the visually impaired in the United States.